Diamond wedding rings are crafted in a dazzling collection of unique and personalised styles. 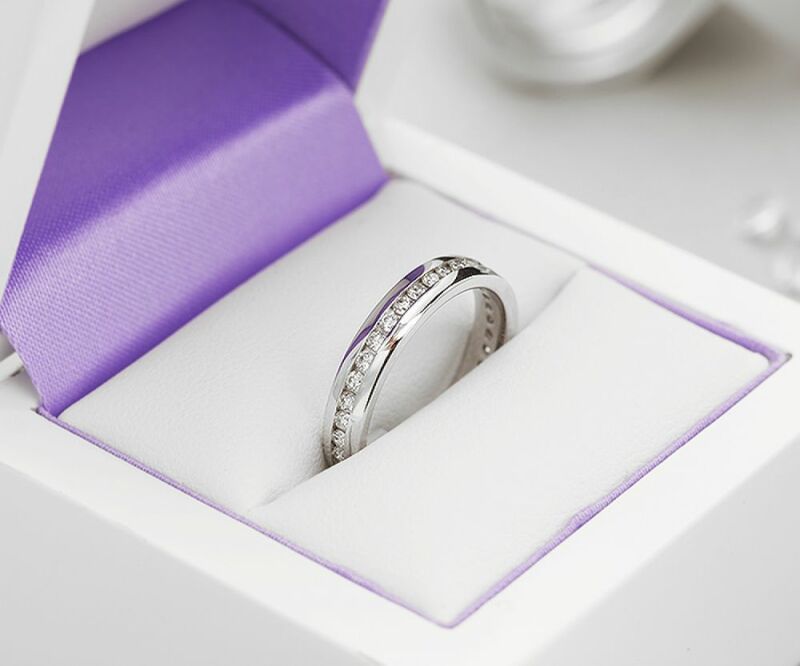 Our designs range from partially to fully set wedding rings in a full assortment of styles. Choose between claw set diamond wedding rings, channel set, flush set, pavé set, bar set and grain set to name but a few. In the page below you will see all of our combined collection including both straight and shaped styles. Most rings are available in an assortment of precious metals, from 950 Platinum to 18ct White Gold, 18ct Yellow Gold, 18ct Rose Gold and Fairtrade Gold. Measuring 10mm wide, this flush set diamond wedding ring has been precison set with 1 carat of diamonds, spaced evenly over the surface of a flat court wedding ring with comfort fit. Extra heavy weight, spanning 10mm wide, this striking wedding ring boasts simplicity and sparkle, crafted in a wide range of precious metal options. Styled with a flat profile, benefitting from a comfortable fit, this men's wedding ring boasts over 1 carat of dazzling white, G colour SI1 clarity diamonds, flush set within an equally spaced pattern around the ring. The Tiara diamond wedding ring is elegantly sculptured to fit around a solitaire engagement ring setting. Beautifully shaped, it features a sweeping curve with graduating diamonds set along the outer edge. Dazzling with beautifully matched diamonds, the Tiara wedding ring sparkled with round brilliant cut diamonds around a shaped band, styled to fit alongside a solitaire engagement ring. The Coronet shaped diamond wedding ring features a chevron of graduating diamonds. Styled to fit alongside an engagement ring, this exquisite design creates a spectacular combination and bridal set. Enjoy dazzling beauty with the Coronet diamond wedding ring, sculptured in a wide choice of precious metals and set along shaped court profile with a sparkling display of graduated diamond sizes. Treasured Moments, award winning diamond wedding ring, stylishly contoured and grain set with brilliant cut diamonds. Purchasing a diamond wedding ring at Serendipity Diamonds is very simple with beautiful ring photography to see all designs close up and in detail. Nevertheless our expertise are on hand when you search through the many diamond wedding rings. 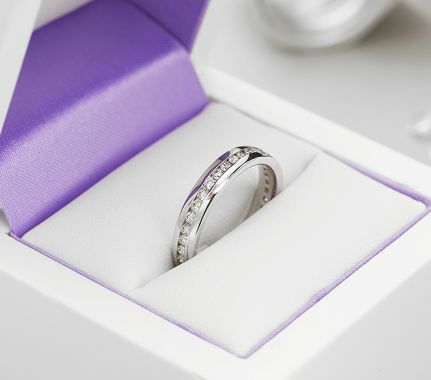 We give expert guidance and genuinely friendly advice to anyone searching for the perfect wedding ring. We can advise on all aspects of the ring purchase from diamond quality to the style of the ring. Commissions are all created to order, taking around 4 weeks to complete work. All diamond set wedding ring styles are precision set with perfectly matched diamonds and hand finished for a dazzling gleaming end result. 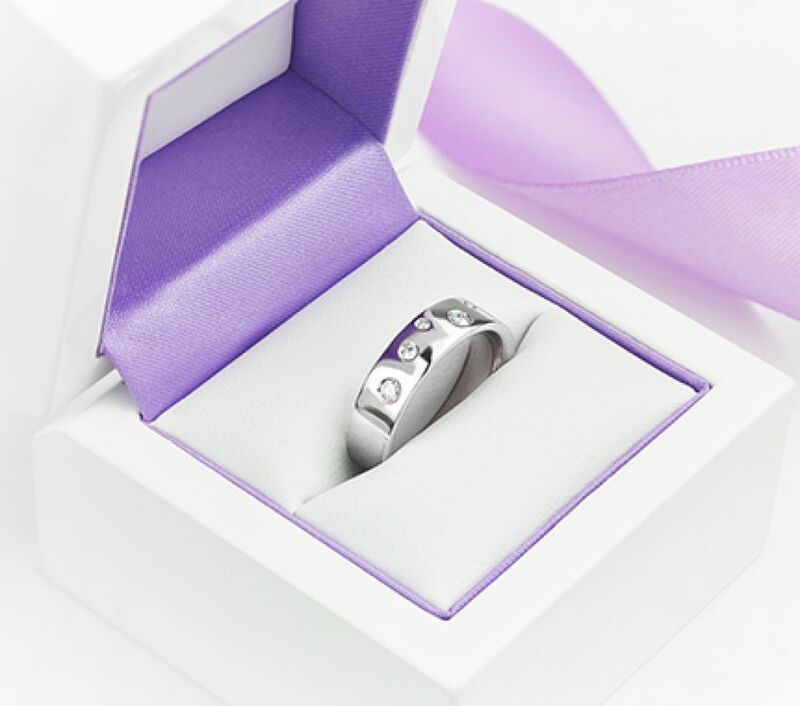 We hand deliver your completed ring by fully insured courier, worldwide and cover regions including UK, Ireland, Europe, USA, Canada and Australia.